E Ink’s thin electronic paper displays have proven to be a hit technology for ereaders, thanks to low power consumption, visibility in broad daylight, and a display that’s, well, like paper. Now E Ink and Epson plan to take electronic paper to the next level, announcing a new high-resolution 300 dpi electronic display suitable for use in ereaders—a significant increase from the 160dpi displays available today. E Ink will be manufacturing the 300 dpi displays, which measure 9.6 inches and have a resolution of 2,400 by 1,650 pixels, and like existing E Ink displays feature ultra-low power consumption, making them ideal for use in ereaders and other portable devices. Epson, in its turn, will manufacturer and support a high-speed controller platform for the displays, using some of the high-speed image processing technology the company has developed for its photo-quality printers—Epson says users will be able to turn pages on the new displays faster than existing ereaders, despite the increased resolution. 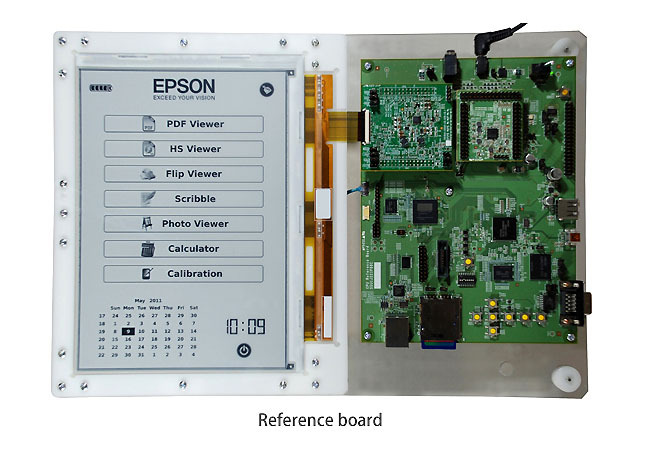 Epson is the top maker of controllers for E Ink displays, and its new controller platform can handle displays up to 3,200 by 2,400 pixels. The additional resolution in electronic paper displays is imporant not only for general readability and display of things like graphics, maps, and pictures, but also improved readability for Chinese and mathematical formulas. There’s no word yet on when 300dpi electronic paper devices might reach the market—but you just know ereader manufacturers would love to have these ready to put on end-of-year holiday gift lists.